Slim, light, and packed with sensors, QuNexus promises to be the most playable ultra-compact instrumental controller out there. Computers and other electronic hardware can be anything as an instrument. But that means you may need something different when it comes time to play them. The first thing to say about QuNexus is that it isn’t a piano. But the first thing to say about pianos is that they’re not at all portable – and they are built for striking strings rather than playing synths. Think instead of QuNexus a super-portable controller for a variety of uses, with added sensors for expression. It’s a hybrid input controller that values expression and mobility above all else. The QuNexus definitely isn’t like other keyboard controllers you’ve seen. But is its unorthodox design what you need on the go and for extra control? 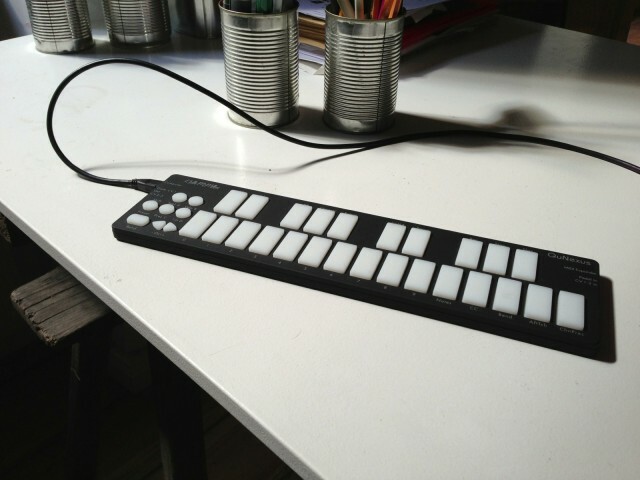 For all the bells and whistles, at its heart, Keith McMillen’s QuNexus is exactly what it looks like: a mini piano made of drum pads. It’s an ultra-slim, ultra-compact slab with pressure-sensitive pads arranged like piano keys. And that’s a good thing. QuNexus performs two tricks conventional keyboard can’t. First, it’s slim and light. You can throw one into your laptop bag and forget it’s there. 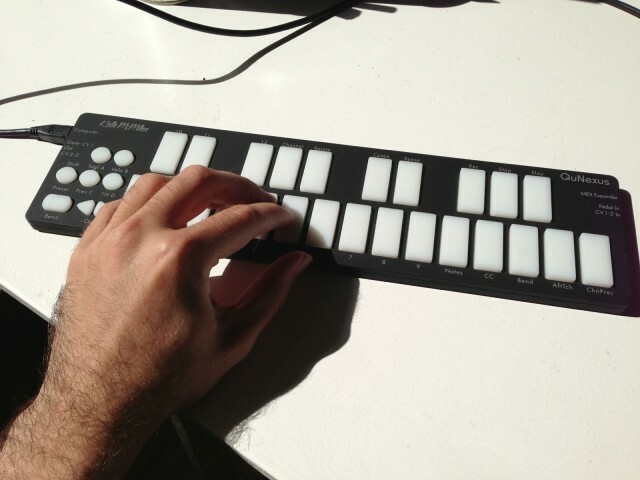 Second, the pressure sensitivity on the pads is uniquely suited to continuous expression, just as drum pads would be. And then there are the aforementioned bells and whistles – loads of them. 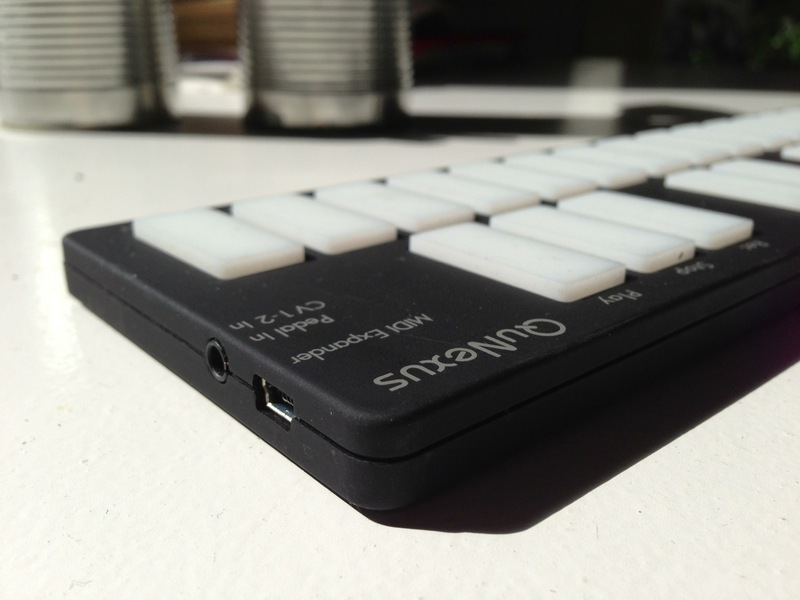 QuNexus has a tilt sensing on the keys, dedicated buttons for on-the-fly editing and preset storage, and even outputs for MIDI expansion and control voltage. Lights include 16-level grayscale lights behind the keys, plus colored lights on the other controls. 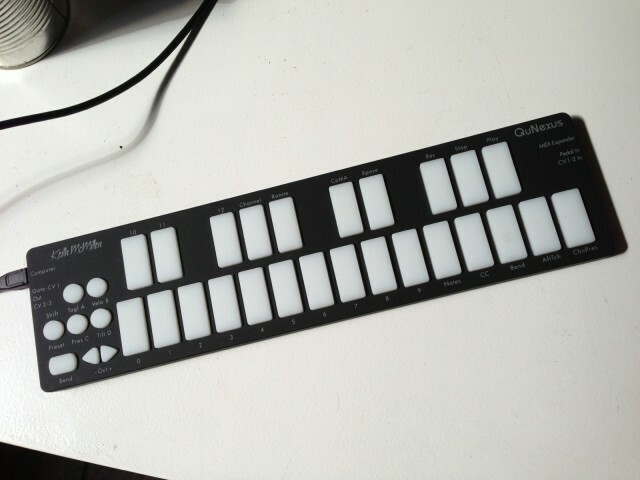 Those lights have defaults for feedback as you play, but they can also respond to messages sent via MIDI, so DIYers can devise their own light shows to work with cutom patches. On the left, the microUSB connection to your computer. Below that, Control Voltage outputs for gate and assignable continuous outputs — hello, modular and analog fans. On the right, an input that can be used either for a pedal or CV input. The USB port for the Expander allows you to attach MIDI DIN ports and chain hardware, via additional hardware from KMI. The QuNexus is crazy-thin, more the size of an iPad case than what we’d normally associate with a music hardware accessory. But in that case, KMI have managed to squeeze loads of ports by using the smallet connectors available. There are jacks for USB MIDI (via a microUSB port, as found on many mobile phones), expression pedals (requiring a minijack converter), and Control Voltage output (KMI has a special cable). Additionally, if you do need conventional MIDI DIN and the like, KMI has a jack for their external MIDI expansion box, though that’s best seen a a studio solution, coming in a big metal case. It’s hard to tell in photos, but the QuNexus feels really nice. While it is extremely thin and has a thin plastic shell, there’s very little flex and the resulting impression is solid. The pads are definitely on the grippy side – .to me, they’re too sticky; I would have preferred a flatter, less textured surface. But that doesn’t impact playing. The pads favor stability over travel distance as you play – the response you feel is largely in the resistance of the pads themselves rather than in much vertical movement. 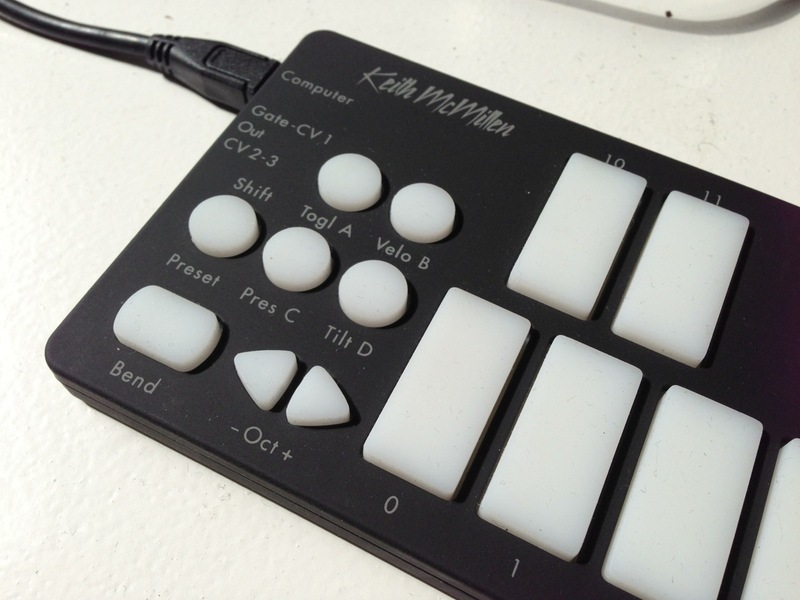 These are not MPC-style pads, full stop. But the result was that I found it was much easier to play melodic lines and even convincing performances on a piano patch. Playing the QuNexus can be immensely satisfying, partly because it can comfortably switch between expressive synth keyboard and drum controller. You just have to embrace the idea that it isn’t a conventional keyboard. The resemblence to that piano keyboard may be the QuNexus’ greatest strength and its most divisive feature. I was surprised to hear some glaringly negative reviews. I think the reason is, as I said at the outset, this isn’t a piano. A traditional key action will always be preferable to a keyboard player. (See the keyboard we previewed yesterday for one with extra expression features.) But the QuNexus is to me the most usable solution when space is a premium. Then there are the added pressure sensitivity controls. These make it easy to add bend or modulation as you play. If you’ve used drum pads with the feature before, none of this is new; it’s really about getting access to that in a piano-style black-and-white layout. There are also dedicated controls for octave up and down toggles. These come with rather garish blinking color feedback. (Personally, I’d rather turn it off, but at least you know which octave you’ve selected.) And there’s a small bend pad on the left side that stands in for pitch and mod wheels. 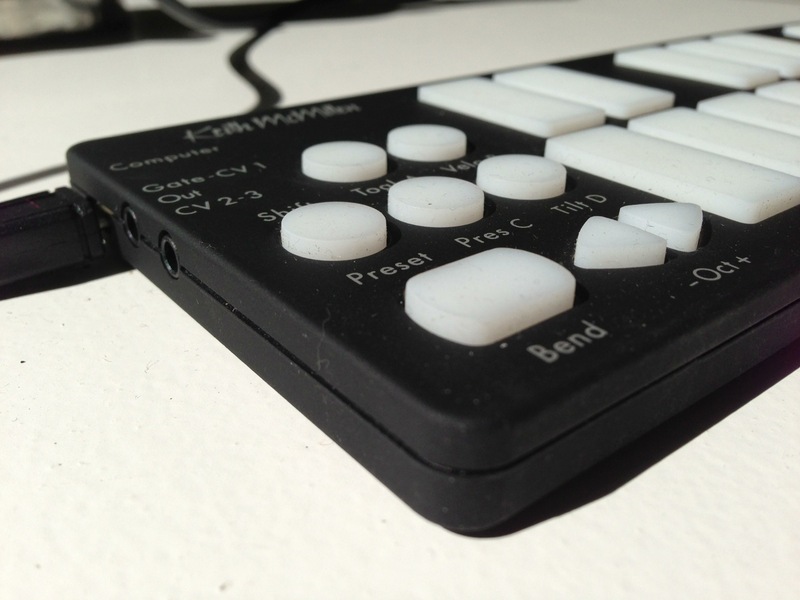 The bend pad doesn’t add much; it’s too tiny and too unwieldy to control for bend. But it’s there, and could be useful for vibrato or other less-particular inputs. No matter: the real advantage here is the continuous control on the keys themselves. And here’s where KMI starts to pull out the stops: there are options for every editing and customization scenario you could imagine. On the left-hand side of the keyboard, you’ll find octave toggles, buttons for storing and recalling presets, and the bend function. KMI’s software comes with a Mac and Windows editing app, plus a quick start manual. I was able to get through most of the functionality just by plugging in the QuNexus: it instantly behaves as a conventional keyboard controller with desktop software and iPad, and much of the onboard controls are self-explanatory. Ditto with the editing software, which while offering per-control options for everything is easy enough to navigate. The quick start will cover the needs of the majority of QuNexus users in short order. Open the full manual and support downloads, though, and you may feel like you’ve been given the note to someone’s computer music class. Every possible hardware rig is considered, every imagineable mapping of every sensor to every parameter of every piece of software, it seems. At one point, they instruct you how to make your own cables and include a diagram of a voltage conversion circuit. It can actually be overwhelming, but everything is there. Let’s start with those editing features you’re most likely to use, and then move on to the fancier stuff. 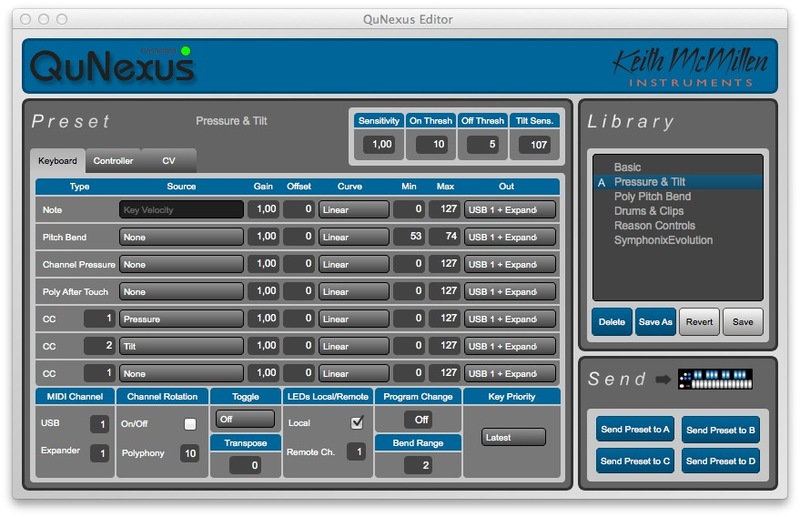 The QuNexus editor is one of the features that sets this controller apart. You have control over every imaginable assignment, plus copious options for adjusting curves to your liking. (You can even do that per pad, if you want to go completely crazy.) The editor is nonetheless easy to follow; I used it without ever looking at the manual. The best part is being able to store four presets for recall on the controller itself. It is vitally important to be able to reassign pressure and aftertouch, because different apps and synths expect different inputs, and to adapt to your playing style. Here, you get the options you need. You can use pressure for modulation or bend, for starters, though the latter takes some adjustment — too sensitive, and you’ll find yourself playing out of tune. But you can also send per-key modulation, which allows more subtle timbral control if assigned intelligently. KMI were thoughtful in giving you some flexibility in how to send those messages. You can transmit polyphonic aftertouch to synths that support it. Some don’t, though, preferring channel aftertouch – a single aftertouch message on any key impacts the whole sound. Here, KMI offers what they call “channel rotation”: the basic idea is to assign different keys to different channels, thus allowing you to use each finger of your hands to send different messages. That lets you work with lots of additional software that otherwise couldn’t use all the pressure information the QuNexus can sense. Mapped to a useful modulation parameter, the QuNexus’ pressure sensitivity really shines. 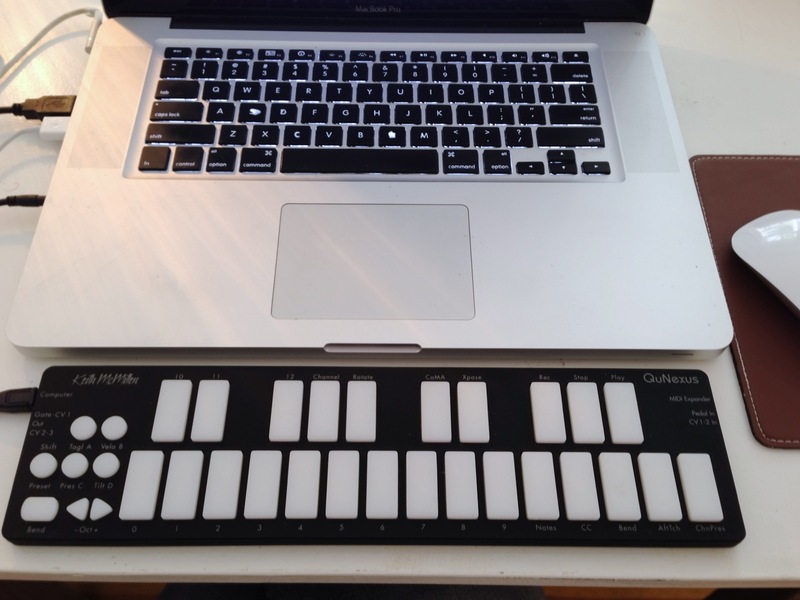 Sure, you could do this with a drum pad controller – but if you’re used to a piano layout, the QuNexus is far easier. 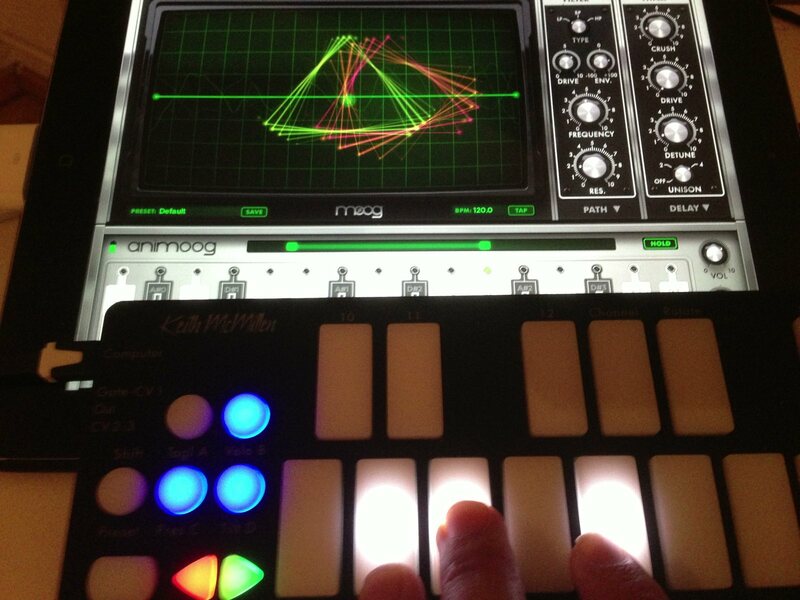 It really is a joy with synths like the iPad’s Animoog. Tilt control is also available. It lets you send additional modulation by tilting the pads. It’s showy, and could be fun for some synth sounds. The trick is working out how to manipulate pads in the direction of tilt as well as pressure. I preferred pressure alone, but this may depend on your tastes. The other limitation of tilt is that, like pressure, it is necessarily connected to depressing a key. That does make some sense in certain scenarios; it’s a bit like playing a whammy bar. You can customize the “on” threshold in the editor. Some sort of continuous controller independent of keys, though, like a ribbon or accelerometer, would have been nice. Again, QuNexus is all about playing keys. Given these different possibilities – and given on some patches you won’t even want the pressure data – the ability to store presets is invaluable. Using the editor, you can set up four patches, and quickly switch between them on the front panel of the QuNexus. You can also use a “control layer” to differentiate control features (like synth parameters) from the layout you want to play. For me, the easiest approach was to set up four playing styles – one without any velocity, one with velocity but no pressure, one with velocity and pressure, one with tilt and all. Then, I could adapt my synth maps accordingly on the computer and iPad. Also invaluable is something KMI gives the acronym “CoMA.” I’d call it the “software is too stupid to map anything that sends more than one message at a time” mode. (I’m looking at you, Ableton Live.) Since a lot of automatic MIDI map modes in software just respond to whatever Control Change message they happen to receive, they’re flummoxed when a controller sends two message at once. This mode lets you hold that software by the hand and make your assignment without incident. There’s also an on-the-fly parameter editing mode, but I don’t recommend it. It’s fine for quick experimentation when you don’t want to resort to the computer, but settings aren’t saved even when you unplug the QuNexus, and the editor is far more convenient than remembering combinations of key presses. Many editing parameters are available for on-the-fly editing, but since they don’t get saved, you’re probably better off using the editor. 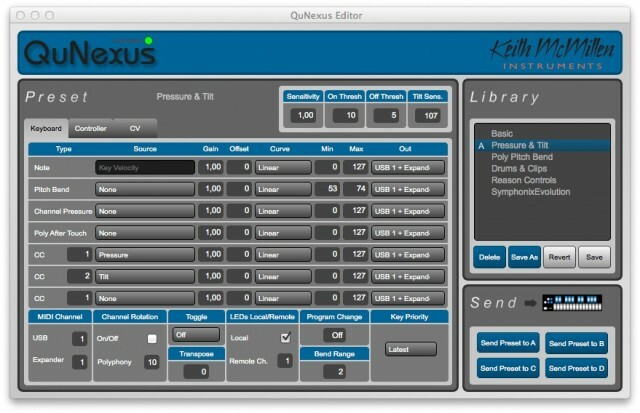 The QuNexus works nicely for playing instruments and custom patches in the likes of Max, Pd, Reaktor, or SuperCollider. It sends MIDI only, but there’s an OpenSoundControl bridge if you prefer. I found MIDI’s data was granular enough for the accuracy of these pads; OSC’s higher data resolution seemed overkill. Where the QuNexus seems less well-suited is as a general purpose controller. There are elaborate custom patches and setups from KMI for doing things like controlling Ableton device racks and launching clips. They’re interesting in theory, but unless you’re triggering obvious glitch effects, it’s just hard to imagine getting a lot of use out of this as a controller. A set of pots or faders would be far easier, and any number of other options (joysticks, Wacom tablets, iPad touch layouts) would be better to control. That’s okay, though: to me, the QuNexus’ main draw is as an instrumental controller. The QuNexus’ small size and keyboard layout will remind analog lovers fondly of control units like those on early Buchla modules. It seems therefore a nice companion for analog gear. KMI has also reduced smooth and improved gate response, which should address any early concerns about analog. Also, because you can use MIDI as an input (via computer or KMI’s own Expander hardware and MIDI DIN), you can use a QuNexus as a converter from MIDI to CV. Looking at how the QuNexus works with analog gear is best left as a subject to a future article, particularly as we again look at integrating a Korg MS-20 mini with Eurorack gear. But otherwise, the earlier advice applies: if you like this kind of playing, the QuNexus should work nicely with your analog rig. I generally travel these days with a laptop and an iPad, sometimes with the iPad alone. But there are endless conditions where I want some kind of tactile input device and don’t have the luggage space for a proper keyboard. For melodic playing, the QuNexus form factor is perfect. I started leaving it in my bag while working on the review, and now it won’t leave. It’s as invaluable to me as my Apple wireless mouse, neatly fitting alongside the front lip of the machine, for working with music software. It’s equally nice as an iPad companion. It’s not hard to imagine people toting this to coffee shops or hotel rooms or bus station waiting lounges. 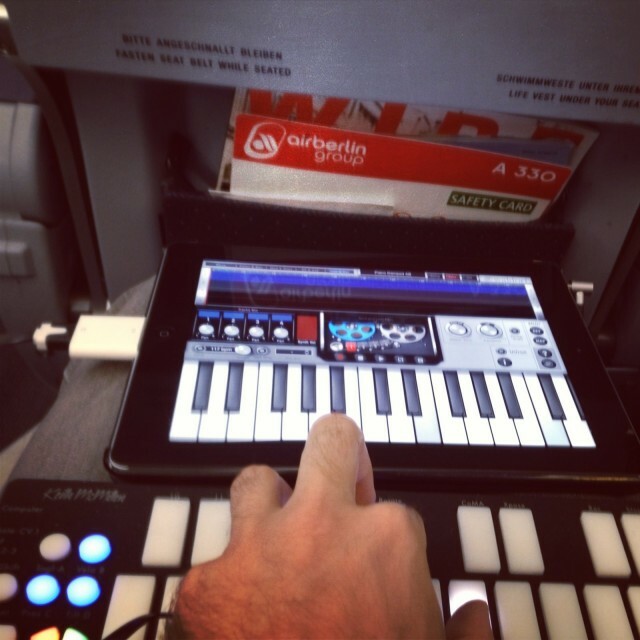 Indeed, I even pulled it out in coach on a transatlantic flight and got some melodic parts recorded. (Okay, I did realize I couldn’t use it on the tray table with velocity sensitivity on – that’d bother the person in front of me. For that, I moved it to my lap and carrier on.) And we’re talking a controller that works when there isn’t enough seat separation to unfold your 15″ MacBook. Tested at 35,000 feet: yes, it’s possible to use QuNexus and iPad in coach. I managed to get some sound designs and melodic patterns together without disturbing anyone – seriously. Oh, and a nice compliment for the idea of the digital instrument: an older man seated next to me asked if I was a pianist as we deplaned. The funny thing about the QuNexus to me is, once you recognize what it is – great portable pads laid out like a keyboard – you may like it a lot more. It’s not a radical departure from existing instrumental inputs. And it’s not the best all-purpose control surface – even KMI’s own QuNeo would likely be preferable for controlling lots of parameters. But that’s not a bad thing. 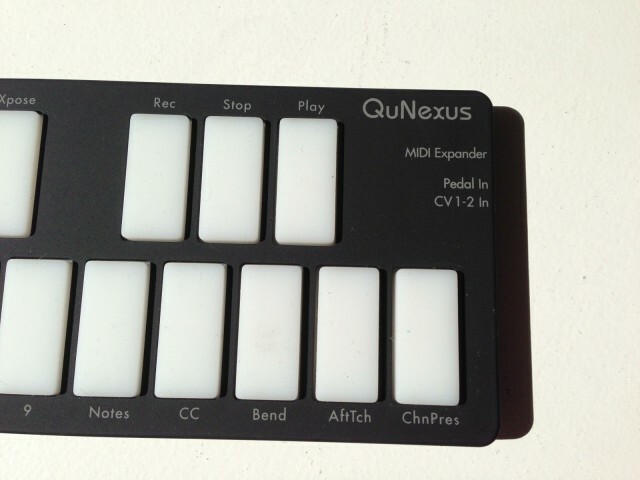 For the price, the QuNexus is an exceptionally-good set of drum pads that you can play like a keyboard. It’s as slim and light as you could imagine, without sacrificing connectivity or functionality. And unlike small, cheap drum pad and keyboard controllers, you feel like you’re playing something that’s comfortable in its own skin rather than a sized-down version of something else. It’s more interesting and more responsive than other devices, and feels more rugged, to boot. Whether you hack it or not, though, I think the QuNexus will be well-suited to anyone wanting a unique input that they can easily carry around. It’s perfectly playable, and small and light enough that you don’t notice it in your bag. The real proof: you may miss it those times you don’t. With street prices around US$150 (€170 from current pricing), for many musicians, it will be a must-buy.